Now it’s time for the eye shadows! I wasn’t sure what to expect. I’d heard such good things that I didn’t think I’d be disappointed but I wasn’t prepared to be quite so delighted either! Rust is an amazingly pigmented shade… it’s a touch too red for my taste but I’ve got it coming up in my next FOTD so you’ll get a clearer idea of how it looks on the eye. I read up on a few forums about Champagne, and it was often suggested as a nice highlight. Damn my paleness ‘cos it’s too dark to use as a highlight for me… it will be a gorgeous shade for a quick wash of colour though – still pleased I bought it. Red Bean Pie looked fantastic on the site and doesn’t disappoint in real life. It’s basically Eggplant but with more plummy/red tones to it. Eggplant is gorgeously metallic, it’s simillar to Red Bean Pie, but a little more purpley. I never use black in the crease, it’s just too harsh for my skintone so I’m always on the lookout for nice greys and Charcoal is the loveliest crease colour for me. I’m very happy I chose it. Last but by no means least is Golden – stunning… proper metallic, highly pigmented.. just beautiful! I’m not disappointed by a single shadow. 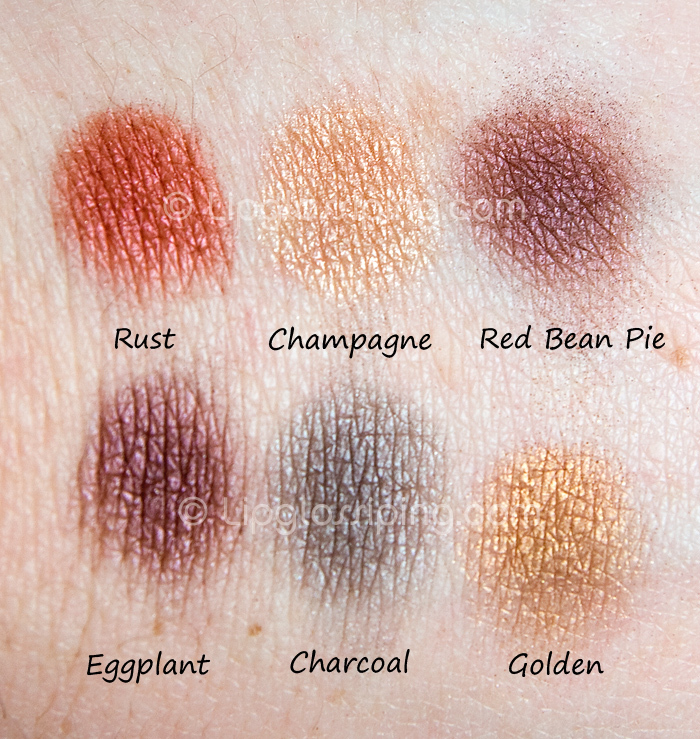 Can I get a little feedback on my swatches? I’m not particularly confident with swatching… I think they’re pretty colour accurate… Let me know if you ever want a particular shade of anything I swatch incorporated into a FOTD, sometimes things just look different in a swatch than when put into context on the face – or maybe that’s just me? Ive been eying the jumbo pencils for a while… ill wait and see what you think before I buy!! Golden loks really really nice. I like your swatches, don’t feel bad if the colours don’t come out as vibrant as you hoped, some products are crappy and that’s all the pigment they will give you. I agree with what you said about colours looking different on hands and on eyes but generally you can tell it’s the same. I have funnily pigmented lids (darker than my hands) but I use UDPP and that brings them up to same colour as my hands so it’s the same colour both ways. Also, I think swatches look different on hands and eyes because you blend it on your eyes whereas you just swatch it on your hand. I have a white pencil for a base which is by 17, but it’s about 6 years old and is the creamiest, whitest mofo in the land. I swatched the newer ones but they are too hard. Hi! I just found your blog recently and I really like it. I’m curious to hear your thoughts on that Milk pencil. I’ve always shied away from it as well, because I too have super creasy eyelids, but maybe at some point you’d be willing to try it as a base with a layer of primer potion underneath, and report back on how it goes? I love your swatches! Your photography is excellent! I struggle with swatches so much but you really seem to capture the accuracy of colours. Soo pretty. I actually have champagne and it is very nice. Rust looks crazy red! I think the swatches look great–in fact your photos are always such a breath of fresh air. How do you like Milk? I don’t have it, but I have some of the other jumbo pencils–and although they’re creasy, I like them in the inner corners, or even as a liner! @Tali – I shall let you know as soon as I work out what the hell I’m gonna do with it! @Rhamnousia – Golden *is* lovely! It’s not that they’re not vibrant.. it’s just I don’t wanna get the shade ‘off’ – think I’m doing ok though! This one is incredibly creamy to be fair. @Becca – Hi Becca, thanks for your sweet comment! I will share my thoughts ASAP – I will definitely try it as a base for you and report back! @Ally – Awww thank you so much. It’s really affordable! Check out the CherryCulture website hun! @Fei – Thanks so much, it is tricky isn’t it! Charcoal is beautiful, it’s a steely grey… fab for the crease. @NDoodles – Rust is pretty full on, fab for the Autumn! @Fantastic – Thanks you so much! I still haven’t used Milk… I’m gonna try it in the inner corner tomorrow like you suggest. I also saw a youtube video about depotting them! Crazy but v. cool! Wow, those reddy colours look lovely- your swatches look great to me! I have the NYX jumbo in milk- I find that, as long as i use UDPP underneath it, it’s fantastic as a base for powder shadows. The only thing I would say is it REALLY clumps on any dryness I get on my eyelids, so I have to be careful with that, and make sure I smother my eyes with cream before bed. I also use it in a thin line under the whole length of my eyebrow, then blended right in, to give my brow a sharper shape- it’s pretty good for that too, although a thin white penci is better.